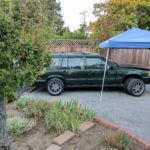 When we last left off with the 960 Volvo project, we were test fitting the engine and transmission to account for the custom motor mounts that weren’t cooperating. 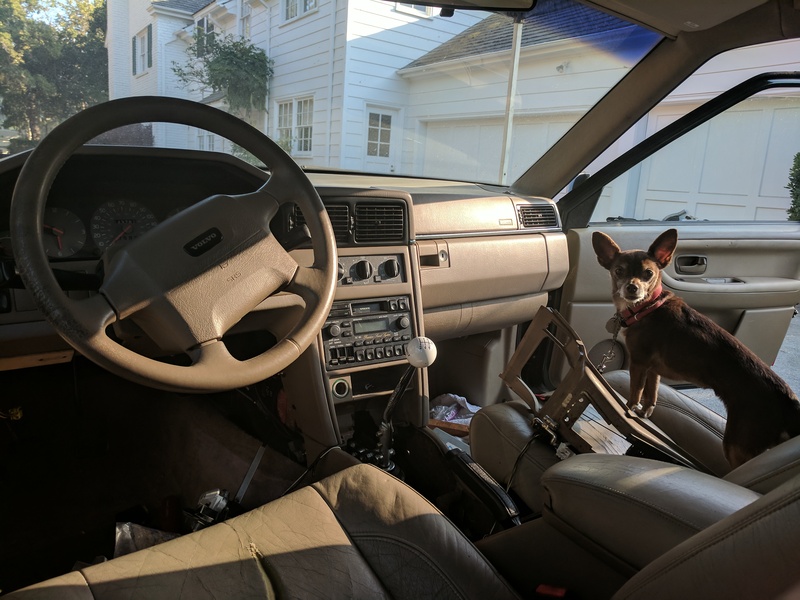 Long story short, we got a hold of Volvo 740 motor mount pedestals and they had the wrong angle. A call to Uncle Wayne, and a pair of custom fabricated motor mount risers were ready in short order. 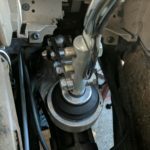 The rubber engine mounts were also changed from e36 M3 to e28 M5. Why you ask? 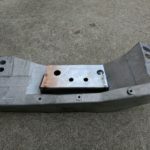 The M3 mounts were too wide, and someone had extra M5 mounts left over from their 24v e30 project. A classic example of Bruce-Tech improvisation. Of course it would be too easy if the motor mounts were our only issue. 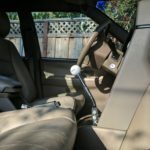 When test fitting the engine with the transmission attached, it became clear that the shift linkage wasn’t going to reach the Volvo’s transmission tunnel opening. According to the Turbobricks experts who’ve done LS swaps on similar Volvos, the T56 should be a near perfect fit. 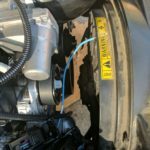 After a considerable amount of internet sleuthing, Willum learned that the linkage mounting points are different between the stock GM Tremec T56 trans and the aftermarket American Powertrain unit with beefed up internals. Oil pan installed and ready for the clutch assembly. 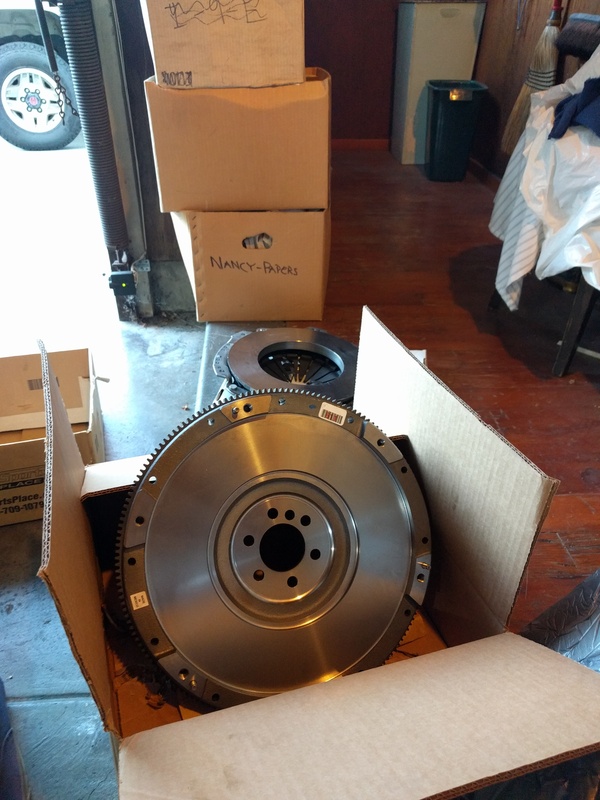 LS7 flywheel waiting for installation. Clutch kit and flywheel officially installed on the LS3. 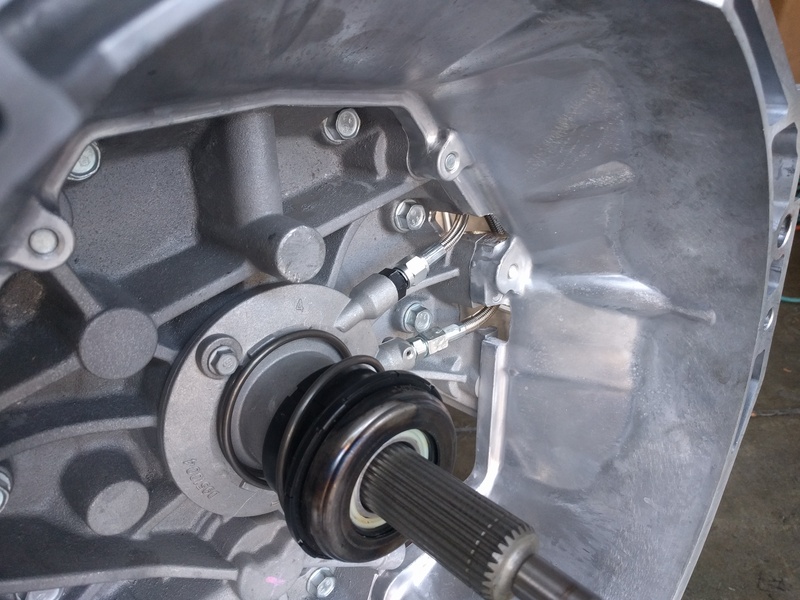 The Tremec uses a hydraulic throwout bearing. 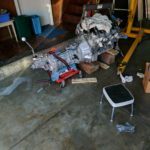 Being a crate motor, there’s not a whole lot to do before it can go in the car. We did however need to install the clutch kit and get our new oil pan in place. 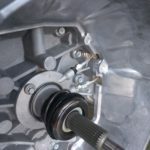 According to GM literature, the transmission needs to be in place to properly position the pan, as the rear of the pan bolts into the transmission bell housing. 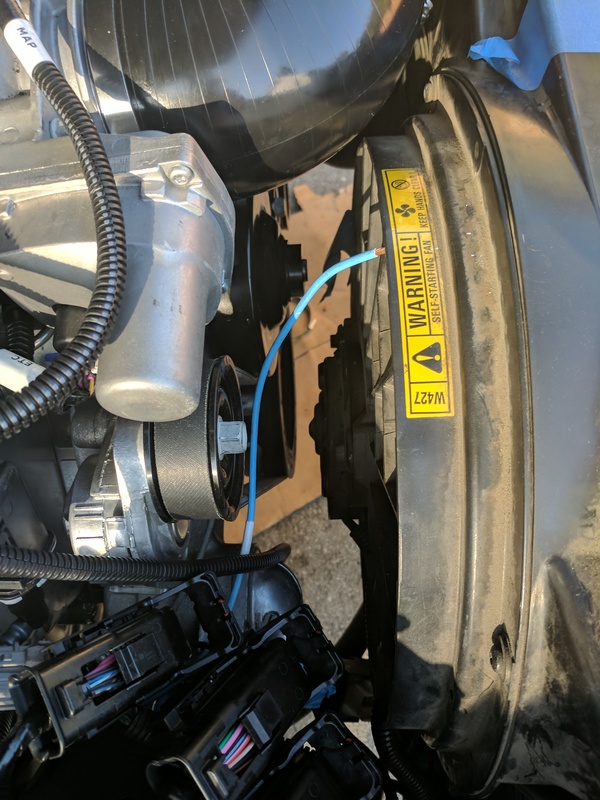 So by that logic, the transmission has to be in place to install the pan and its gasket, removed to install the clutch and flywheel, then installed once more. Candy Land anyone? The LS7 clutch setup means the business. If it can handle the 505 horsepower C6 Z06, then it will be more than enough for the Volvo’s LS3. 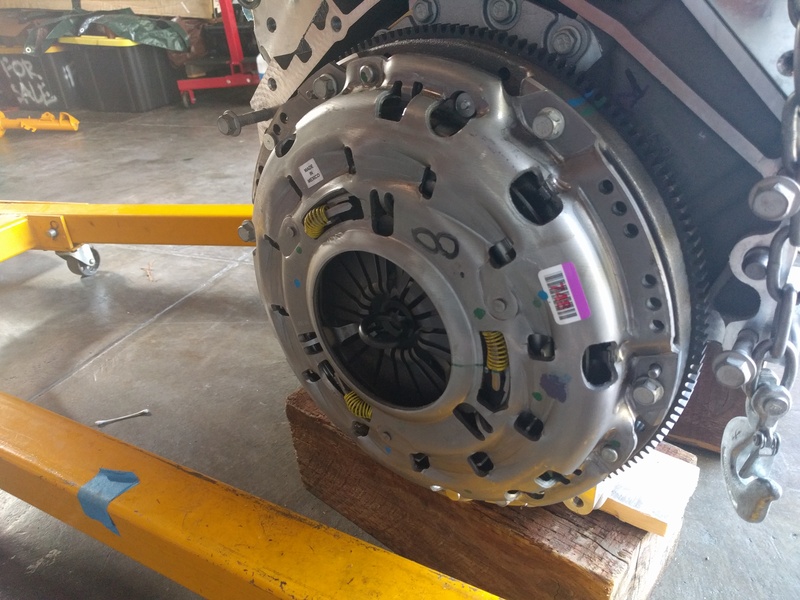 The flywheel is at least twenty-some-odd pounds, and the clutch kit felt even heavier. 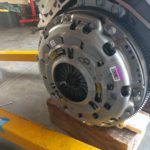 Unlike some other flywheels we’ve installed, the LS engine requires torquing the flywheel bolts in three passes, starting with 15 and 37 lb./ft., then officially torquing the bolts to 74 lb./ft on the final go-around. 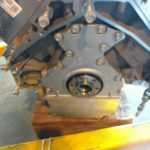 The pilot bearing was hammered into place, and on went the clutch. 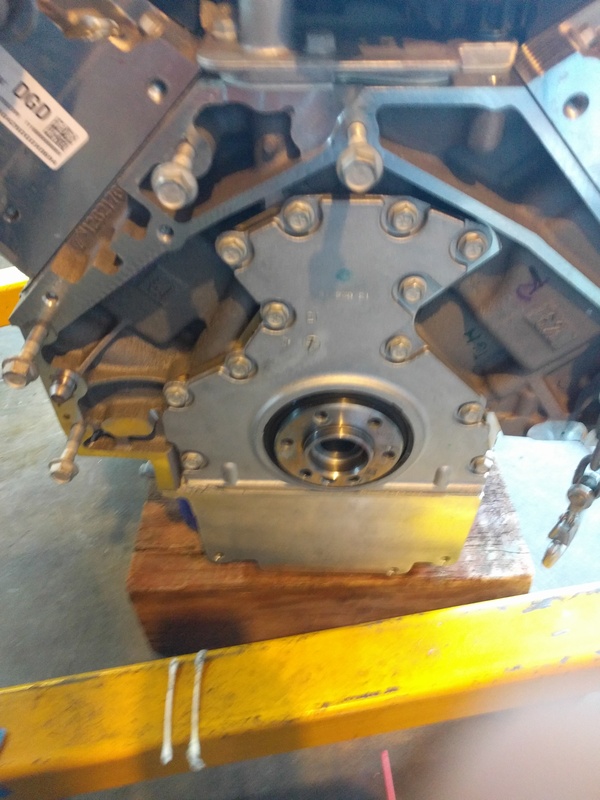 This time the transmission was filled with gear oil before being bolted back onto the motor. Don’t worry, the throwout bearing made it to the party as well. 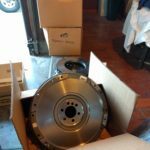 With the motor ready to go back into the car, we still had an annoying task at hand to deal with: the dreaded pedal box. Working under the dash is quite a miserable experience. It’s cramped and you have to contort your body into shapes that only Olympic gymnasts would deem reasonable. With a lot of fiddling, sliced fingers, and profanity, the old pedal box was removed. 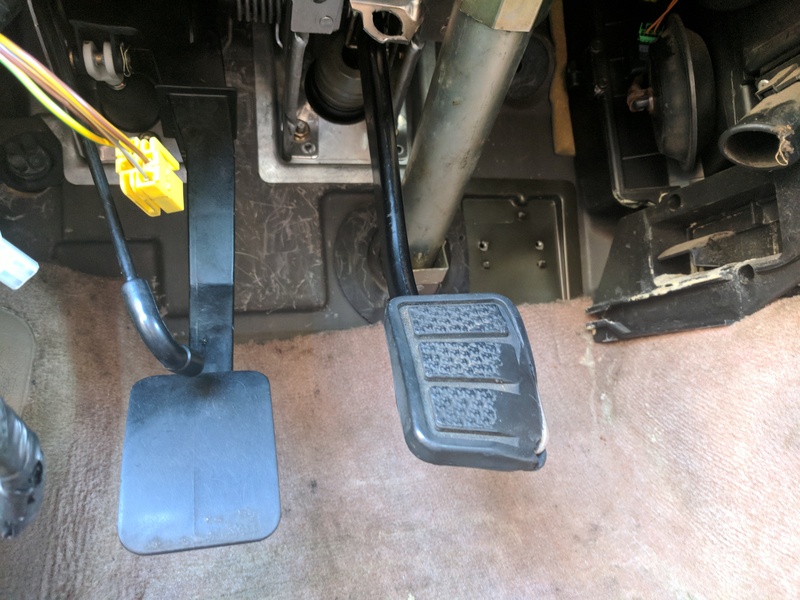 A similar process was used to get the manual pedal box into place, but at least it’s finally installed. 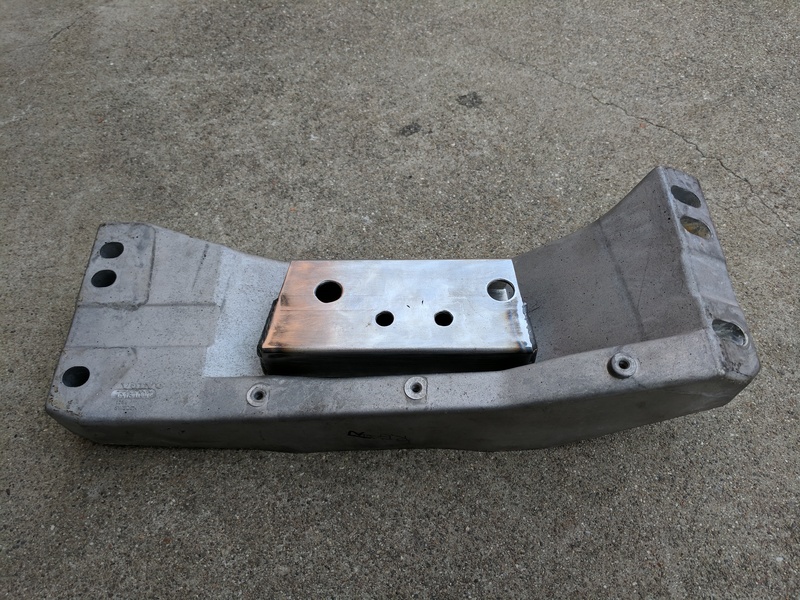 The battle isn’t over though, as the E-Rod uses an electronic gas pedal, and it won’t work as is, so another custom mount has to be made in an effort to match the height of the other pedals. 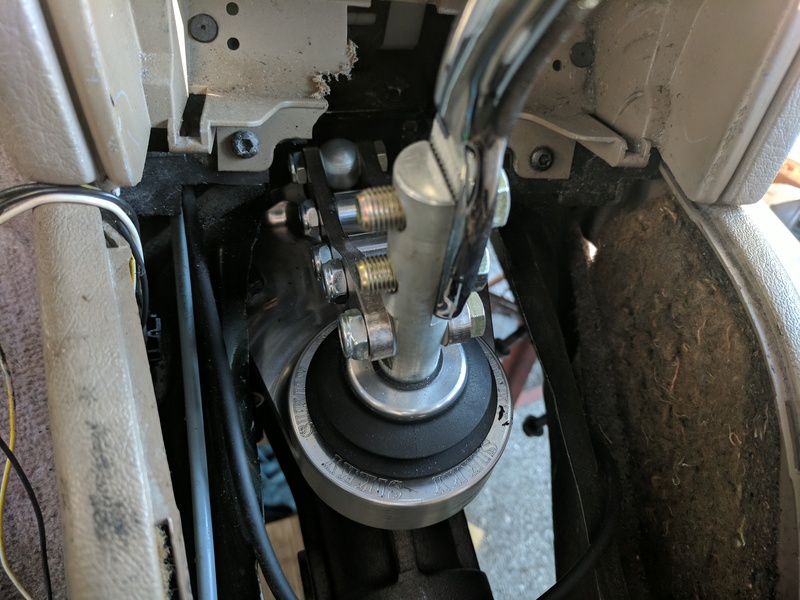 The Volvo’s existing firewall opening for the throttle cable will have to be enlarged, as the E-Rod pedal uses a rectangular connector that has no intent of passing through the tiny circular opening. 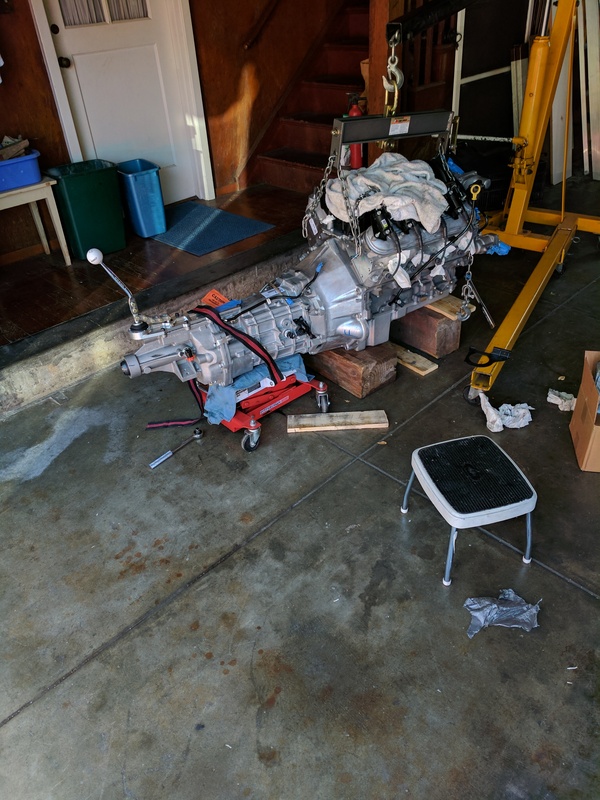 Engine ready to be installed…again. 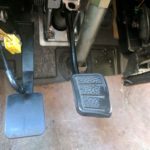 The volvo manual transmission pedal assembly was anything but fun to install! The trans tunnel opening still had to be enlarged to get the modified linkage to fit. 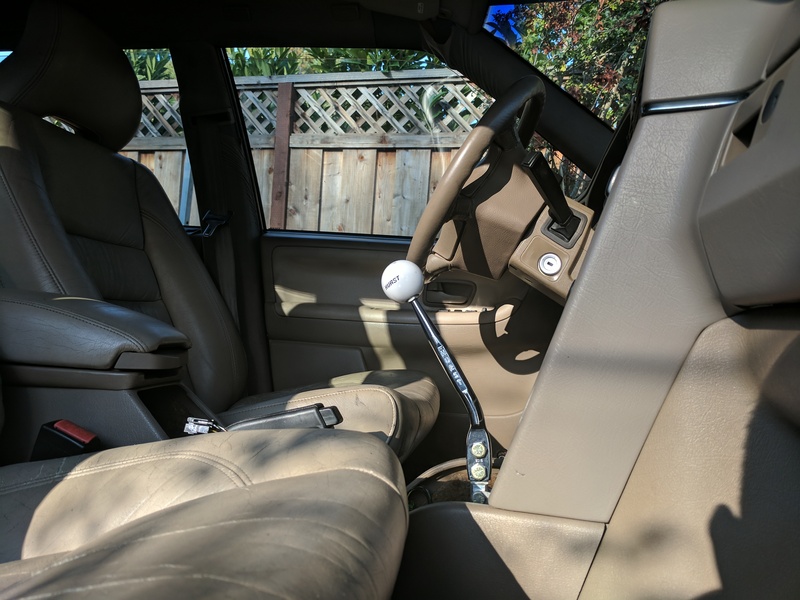 The shifter finally sits at a good height and doesn’t interfere with the center console. 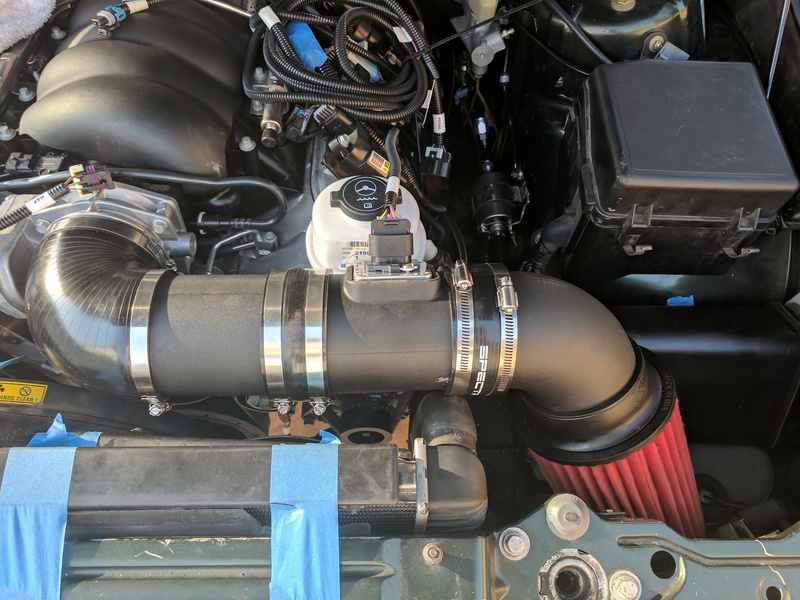 Next on the immediate to-do list is adjusting the fitment of our custom transmission brace, take driveshaft measurements, then start plumbing the cooling system and fuel lines. 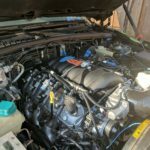 Interestingly enough, the stock Volvo radiator can be retained for swap. Even more hilarious is how the stock 960 exhaust can still be used on the V8. 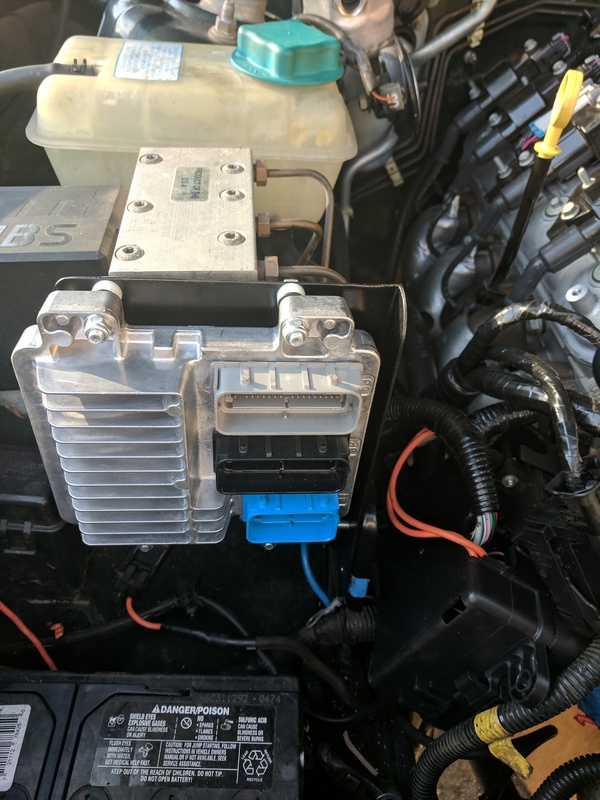 The wiring harness connectors are slowly finding their homes. Bruce made custom brackets to mount the ECU and fuse box within easy reach. Here’s the custom transmission brace. It’s the stock 960 auto trans brace with a welded adapter plate for the T56. We’re still working out some fitment issues though. Back to the drawing board! Before I forget, we have good news! No, it’s not the Dacia Sandero. As we may have mentioned before, the Volvo has skinny little 15″ wheels with measly 195mm tires. With the pushrod-titude guaranteed to overwhelm the 960’s all-season rubber, a stickier, wider contact patch is absolutely necessary. 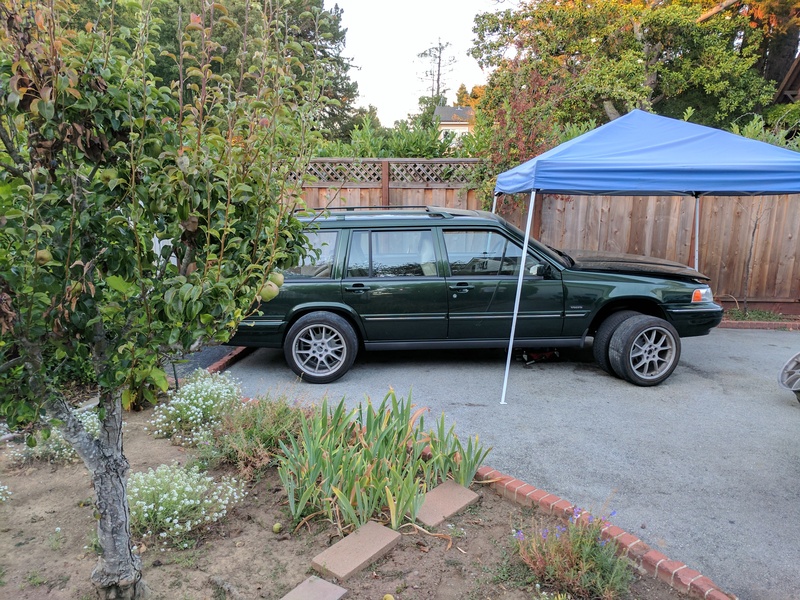 Good old Craigslist had a set of 17×8” BBS RK wheels in the oddball 5×108 bolt pattern, so they were purchased on the spot. They need a coat of paint, but more importantly, they’ll allow us to use 235 width summer tires. Not only will the green wagon put down the power better, but it’ll look pretty spiffy, if I do say so myself. Space is getting tight as things are installed. Here’s how the intake tract will look. 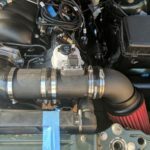 The stock Volvo puller fans seem like they should be up to the task of keeping the V8 cool. Sneak peak of the 960’s new set of shoes. BBS RK, size 17×8. Things are coming together, and we’re hoping to get the 960.2 fired up soon. 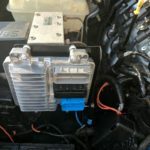 The wiring harness is mostly plugged in, and Bruce has been working on where to permanently locate items like the fuse box and carbon canister. 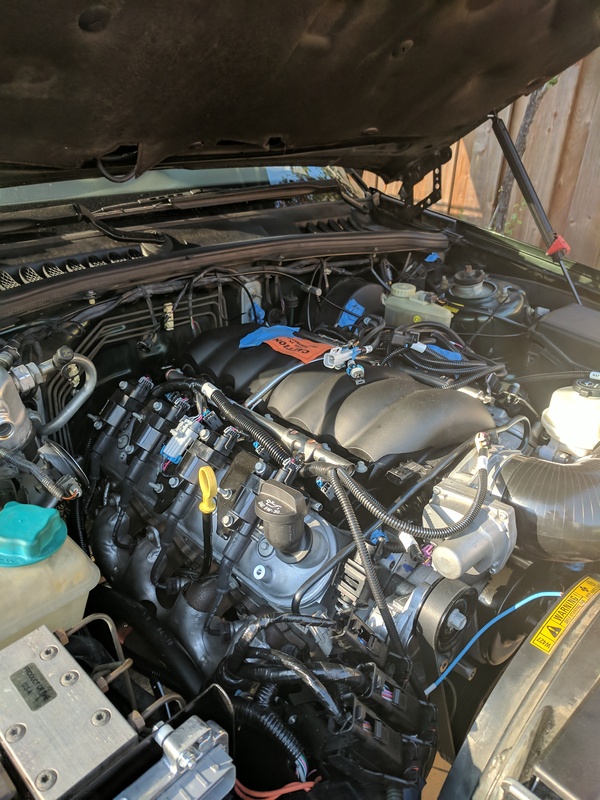 There will still be a host of items that need massaging once the car is up and running, but the LS3’s first test drive is (fingers crossed) just around the corner, and everyone is becoming very excited. Vroom-Vroom.